This free cooking party sounds like fun. It’s part of Brooklyn Brewery’s festivities in March (info). A social community centered around cooking and conversations, where friends and soon-to-be friends cook and talk together while enjoying delectable dishes. Sunday, March 17, at 6 p.m. (Note: The previous date was changed) – Free | A stalwart citizen opens his kitchen for a 150 person cooking party where everyone is a cook. There will be 7 cooking stations including 2 food trucks, a chandelier wok, indoor kitchen and plenty of grills. 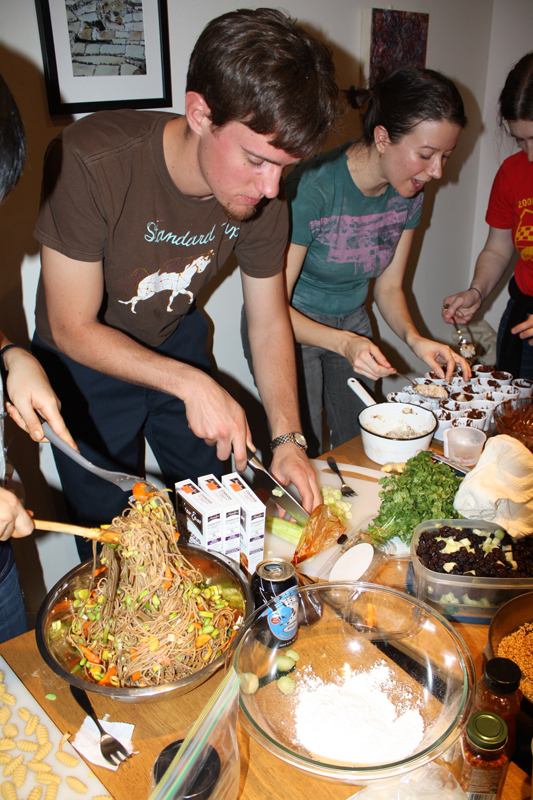 Each attendee brings the ingredients and everyone cooks together. Dishes are passed around, and there’s plenty of Brooklyn beer to enjoy. For location details, go to ChaosCooking.com. You have to go to the site, sign up (we did it through Facebook to make it easier) and then you get the secret location. An international community of incredible people who share a passion for food, drinks and good conversations. Our staple event is where everyone brings the ingredients for one dish and then cooks together in one space. All recipes must be finished and space returned to original condition by the end of the event, while everyone is socializing, enjoying drinks and eating tasty dishes. Featured in the NY Times and NPR. Everyone must pitch in to help restore the space to it’s original condition. Try not to lose any fingers. Bring the ingredients necessary for a bunch of people to try a little bit of your dish. Extra knives, cutting boards, big bowls, grilling surfaces and Tupperware to bring any extra food home. Our friends at the Brooklyn Brewery will be providing free brew to everyone to celebrate their MASH Tour of Brooklyn culture. Beaucoup Juice. Fresh Juice Snowball machine. A 30″ Cantonese style chandelier wok on a mega burner. Two more hours! We’ve got our ingredients and we’re ready to cook. Woohoo!